Recently, compression software used in computers to compress data has become an indispensable computational tool. Why is this compression possible in the first place? Information commonly possesses redundancies. In other words, information possesses some regularity. If one randomly types letters of the alphabet, it is highly unlikely that these will form a meaningful sentence or program. Imagine that we are assigned a task of communicating a sequence of 1000 binary digits via telephone. Assume that the 2nth and (2n +1)th digits of this sequence are the same. Naturally, we would not read out all 1000 digits of the sequence; we would first say that the 2nth and (2n +1)th digits are the same, and then read out the even-numbered (or odd-numbered)digits. We may even check whether there is any further structure in the sequence. In this way, compression software works by changing the input sequence of letters (or numbers) into another sequence of letters that can reproduce the original sequence, thereby reducing the necessary storage. The compression process may therefore be regarded as an encoding. This procedure is called source coding in order to distinguish it from the channel coding examined in Chap. 4. 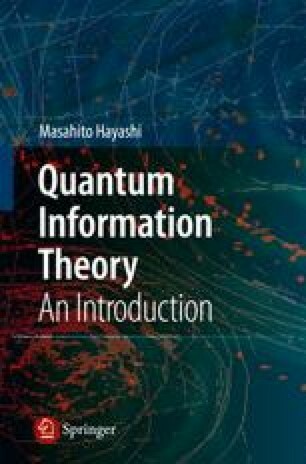 Applying this idea to the quantum scenario, the presence of any redundant information in a quantum system may be similarly compressed to a smaller quantum memory for storage or communication. However, in contrast to the classical case, we may identify at least two distinct cases. The task of the first case is saving memory in a quantum computer. This will be relevant when quantum computers are used in practice. In this case, a given quantum state is converted into a state on a system of lower size (dimension). The original state must then be recoverable from the compressed state. Note that the state to be compressed is unknown. The task of the second case is to save the quantum system to be sent for quantum cryptography. In this case, the sender knows what state to send. This provides the encoder with more options for compression. In the decompression stage, there is no difference between the first and second cases, since they are conversions from one quantum system to another. In this chapter, the two types of compression outlined above are discussed in detail.